This adorable lion is playing peek-a-boo! His face is in one corner and his tail is popping out of pocket in another corner. 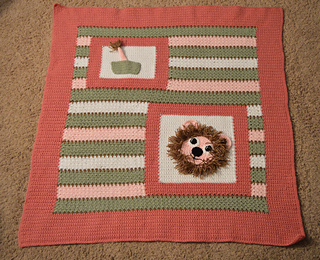 Boy and girl babies will love the sweet face and the great textures of this blanket. 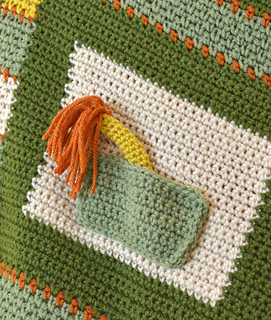 The border is stitched along with the body of blanket. 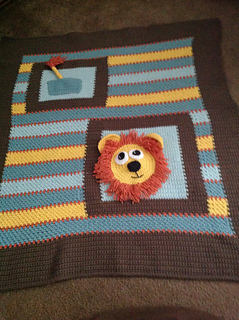 The lion’s face and tail are added to the blanket once it is completed. 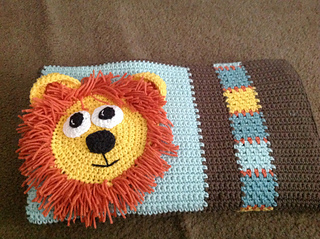 Perfect for nurseries with a safari or jungle theme. Expectant parents would love to receive this as a shower gift. This is a crochet pattern, not the finished blanket. SKILL LEVEL: Easy/Intermediate; must be able to change color mid-row, be able to maintain tension when changing stitch patterns mid-row and be able to work with multiple skeins attached. HOOKS: I (5.50 mm) hook or sizes needed to obtain correct gauge. G (4.0 mm) hook for lion’s tail only. OTHER/NOTIONS: Stitch markers, yarn needle. PROMOTION! All Crochet by Darleen Hopkins Patterns and Pattern Collections (eBooks) on Ravelry are Buy 2, Get 1 Free. No coupon needed. Ravelry will automatically deduct the least expensive pattern from your total. After you make it, PIN IT on Pinterest and tag it with #CbyDH to be added to the “Show off Your Crochet by Darleen Hopkins Projects” Pinterest page.